The Catawba grape seems particularly liable to be affected by a peculiar disease, which is termed rot; the berries when about full grown become spotted and exhibit an appearance very similar in structure and character to a badly diseased potato. Not only is there a similarity in the appearance of the two, but both are greatly accelerated, if indeed they are not occasioned, by wet soil. 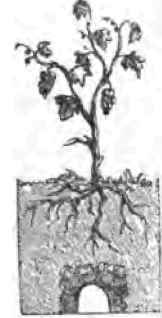 I have observed the Catawba grape closely for many years, and my observation leads me to believe that the rot is owing to an excess of water at the roots, rendering the ground comparatively cold, at a time when the air is very warm; of course this will be of rare occurrence where the surplus water in the soil passes into underground drains. I would suggest to those who have strong or clayey lands to put in a row of draining tiles under each row of vines, and if there is no convenient fall for the water to pass off, then dig a round pit three or four feet deeper than the drains, fill this pit with broken stones, or oyster shells, and lead the drains into it The accompanying sketch will illustrate my meaning, and I am very confident that the remedy will be found efficient. X. Y. Z.